There’s a work of genius lurking inside “Downsizing,” one that struggles to make itself heard and ultimately loses steam and dribbles away. Bottom line: The first half of Alexander Payne’s sci-fi/fantasy satire/end-of-the-world warning is pretty wonderful. After that, things get iffy. In the film’s first moments we’re introduced to the concept of “downsizing” — not corporate layoffs but rather the shrinking of human beings to the size of Barbie Dolls. Downsizing could be the answer to, well, everything. An ear of corn could feed a dozen people for a week. Tiny homes require almost no power to heat and cool efficiently. Moving around is easy — downsized citizens ride in shoebox-sized containers that can fit easily in a bus or airplane’s overhead rack. Omaha residents Paul and Audrey Safranek (Matt Damon, Kristen Wiig) are initially bemused by this new technology. But after a decade of hand-to-mouth living they come to the conclusion that downsizing is the key to a prosperous future — especially when it is explained to them that after downsizing their modest savings will translate into millions of dollars. So they contract to live in a downsized community (a glass dome offers protection from predatory birds). This mini-metropolis takes up only a couple of acres of real-world real estate but, in shrunken form, is the size of greater New York City. Their built-to-order mansion awaits. The actual process of downsizing is cleverly laid out in Payne and Jim Taylor’s screenplay…and it’s a techno-nerdish wonder. Once sedated, the client’s dental fillings are removed (only organic tissue can be shrunk…a ceramic filling could cause the client’s head to explode). All body hair is shaved (again, hair follicles are not alive…only the roots). Once downsized, the comatose clients are moved about on spatulas, like burgers on a short-order grill. It’s all very amusing, yet weirdly plausible. Just one problem. Upon awakening Paul learns that Audrey got cold feet at the last minute. She now wants a divorce from her tiny husband and most of their savings. It’s good to see Matt Damon back in action. “Jason Bourne” marks his return to the renegade spy franchise after sitting out 2012’s “The Bourne Legacy” (in which Jeremy Renner played a fellow super assassin). But let’s get real: This installment is less a continuation of the saga than a recycling of stuff we’ve already seen. To say it’s superficial is giving it too much credit. Writer/director Paul Greengrass (who helmed Nos. 2 and 3 in the series, “The Bourne Supremacy” and “The Bourne Ultimatum”) doesn’t even make a token effort at original plotting or character development. Nobody in this film has an inner life. What he concentrates on to the exclusion of all else is movement. The film is one long chase around the globe (Greece, Iceland, D.C., Berlin, London, Las Vegas) captured in jittery handheld camerawork and rapid-fire cutting. Is there one shot here that runs for as much as five seconds? Don’t think so. At first it’s exciting. The movie radiates energy like a pubescent boy on a three-day Red Bull binge. After a while it becomes numbing. We encounter our fugitive hero on the Greece/Turkey border, where he has a gig as a street fighter. Basically he beats up other pugilists for money. It’s ugly work, but it keeps Bourne off the grid. Enter former CIA agent Nicky Parsons (Julia Stiles), who has turned on her former employers and has now discovered evidence of the origins of the Treadstone superspy program — including a revelation about the crucial role played by Bourne’s late father. But back in Virginia, CIA director Robert Dewey (Tommy Lee Jones, looking ever more like a 3-D topographical map of Arizona) is on the hunt for our man. Dewey is putting the final touches on a sixth-generation version of Treadstone and doesn’t want a wild card like Jason Bourneout there to spill the beans. He employs the talents of cyber analyst Heather Lee (Alicia Vikander) to track down Bourne. Soon Heather comes to believe that maybe Bourne isn’t such a bad guy after all (although her long game is hard to pin down). 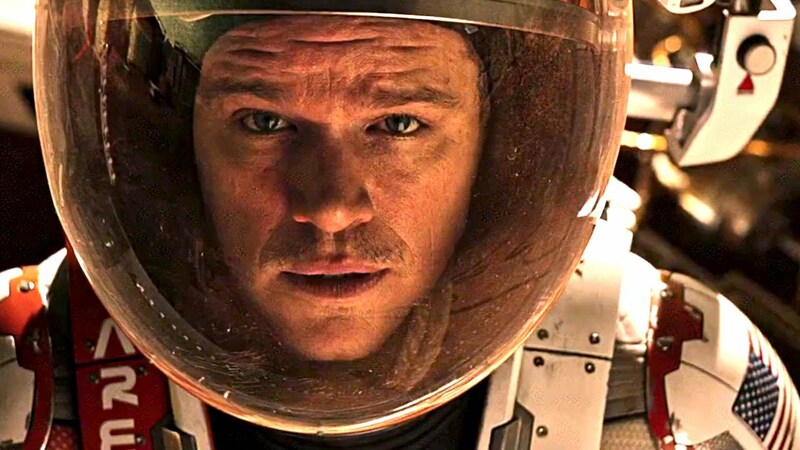 With “The Martian” director Ridley Scott and star Matt Damon deliver an almost perfect piece of popular filmmaking, an intimate sci-fi epic that is smart, spectacular and stirring. This big screen adaptation (by screenwriter Drew Goddard) of Andy Weir’s best-seller about an astronaut stranded on Mars has just about everything — laughs, thrills, visual splendor and a rousing endorsement of the brotherhood of man. It’s the least pretentious and most wholly enjoyable film of Scott’s extensive career (which includes “Alien,” “Blade Runner,” “Thelma & Louise” and “Gladiator”) and pushes Damon’s acting talents to the max. The premise melds elements of 1964’s “Robinson Crusoe on Mars” and “Apollo 13” (earthbound scientists and engineers invent ways to help their desperate colleague). And nestled inside this riveting adventure is a sly commentary on bureaucracy. 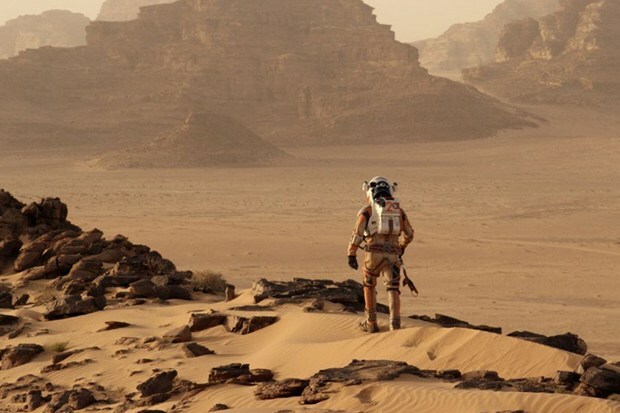 Set in a near future in which the American space program is thriving (the film’s most patently fantastic assertion), “The Martian” opens on Mars, where a team led by Melissa Lewis (Jessica Chastain) is wrapping up a month-long scientific mission. A fierce sandstorm catches the astronauts out in the open, and they barely make it to the Martian lander that will return them to the orbiting mother ship. But one of them, botanist Mark Watney (Damon), is literally blown away by the raging wind. Believing him dead, Lewis has no choice but to take off without him before the storm makes liftoff impossible. But Mark isn’t dead. He awakens to a beeping alarm in his helmet telling him he’s almost out of air, struggles out of the sand in which he is half buried and discovers that he’s been skewered by a shard of wind-blown metal. Most of the films George Clooney has directed — “Confessions of a Dangerous Mind,” “Good Night, and Good Luck” and “The Ides of March” — have found him stretching himself, developing a style that was part indie edgy and part Hollywood classic, with a choice in topics that skewed liberal and humanistic. 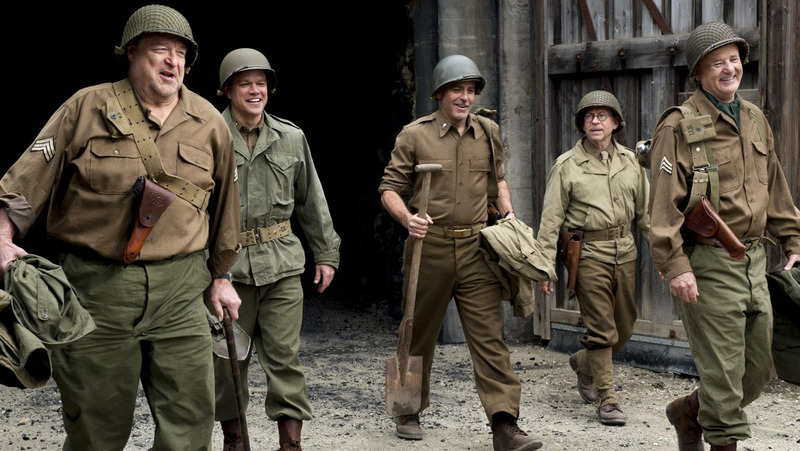 His latest, “Monuments Men,” based on the real-life exploits of art experts who recovered masterpieces stolen by the Nazis, hits the Hollywood classic part perfectly. In fact it feels exactly as if it could have been made by a big studio in the early 1960s. It’s been lushly produced, carefully scripted, tastefully shot. But edgy it isn’t…there’s hardly a moment here that doesn’t seem to have been painstakingly weighed and thought out in advance. Clooney — with a trim ‘stache and graying temples that make him look remarkably like a mature Clark Gable — portrays Frank Stokes, an art expert who creates a unit within the U.S. Army with the sole purpose of tracking down and saving art masterpieces looted by the Germans. He recruits a decidedly un-military bunch of art specialists, most of them pushing 60, who must undergo the rigors of basic training before they can be deployed to recently-liberated Normandy to begin their search. Matt Damon is this generation’s Jimmy Stewart. The guy rarely looks like he’s acting and yet we believe everything that comes out of his mouth, every gesture his characters make. Certainly it’s hard to imagine any other contemporary actor pulling off what Damon accomplishes in “Promised Land,” a film that could easily have become a shrill pro-environmental screed but which, in Damon’s capable hands, becomes something far more challenging and subtle — a character study of an individual who may have convinced himself that wrong is right. In the latest from director Gus Van Sant, Damon plays Steve Butler, a hotshot aquisitions man for a natural gas company. Steve’s job involves traveling around the country to purchase drilling rights from farmers and other property owners. He can take a failing ranch or a economically-strapped town and turn it into a cash cow. As he unassumingly notes, he makes people millionaires. Clearly, Steve loves his job. He gets to hand out big chunks of money, turn around lives, leaves the world a better place. There’s no shortage of big names in the cast, but the real star of “Contagion” is filmmaker Stephen Soderbergh. His latest is a hypnotic juggling act, a carefully calibrated mashup of characters and situations that proves him a master storyteller. This time the maker of “Traffic,” “Erin Brockovich,” “Che” and “Out of Sight” (and, yes, the “Ocean’s” flicks) delivers a “what if?” thriller about a killer flu pandemic that puts mankind on the ropes. “Contagion” paints a grim but fully-detailed picture of how we’d react in such circumstances, and it’s not pretty.